You may have seen on our social media that we use the hashtag #OneTeam when we see football teams or coaches interacting with their college band. The reason for this is simple, for too long bands have been shoved the side and disregarded by athletics and their universities. The message is one of unity and support for each other because without the band at a college football game the pageantry, tradition and energy are lost. 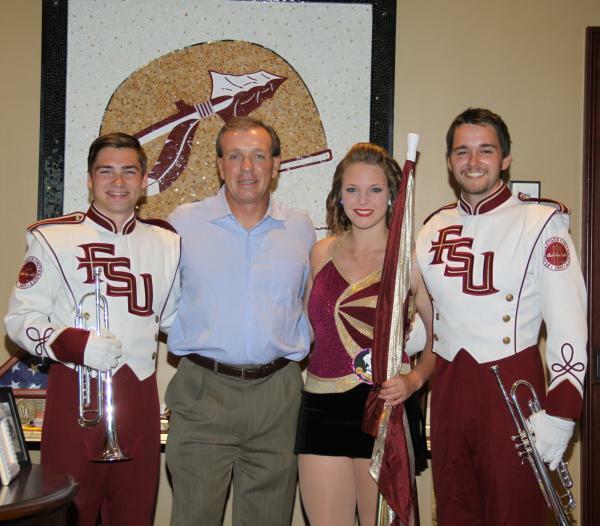 At Florida State the relationship between head football coach Jimbo Fisher and the Marching Chiefs is one that all bands can be envious of. Fisher, like many coaches across the country, comes to address the band each summer before the first game. His message is usually the same, the band is vital to the success of the team and university. The band and Fisher also have a special relationship off the field as they work on finding bone marrow donors with Be The Match and Jimbo's Kidz 1st Foundation. To date, three members of the Marching Chiefs have been bone marrow donors which from a statistical standpoint is amazing. Fisher has never forgotten that and will always be a huge fan of the band.